It’s unlikely to be in McGrew since his book covers 20th century type and this is clearly 19th century. It would make it a lot easier to identify if you could show, or describe, the pinmark. This face has been revived at least once digitally - in 2013 by Paul Smith as “Ressonant” - a clever not-quite-the-same name. But I’m not sure that this is the right match - I don’t know of a better showing of Renaissant and I can’t make out all of the detail in your photo of your type/proof. I just bought the book, sorry about that proof, way to much ink. I will reproof it with a gentle kiss to see if i can pull those fine lines that your image shows. SoX, I will look for the pinmark, tomorrow when I get into the shop. I’m pretty sure that was the first thing I looked for….and there was none? SoS, When I looked at the type this morning I did find the pinmark. I looked thru a couple sites but did not find this particular mark. David, thanks for the book suggestion. I look forward to going thru it. I agree that the face is indeed Renaissant. It shows up in my 1898 ATF specimen book that was issued by the Dickinson Branch of ATF. 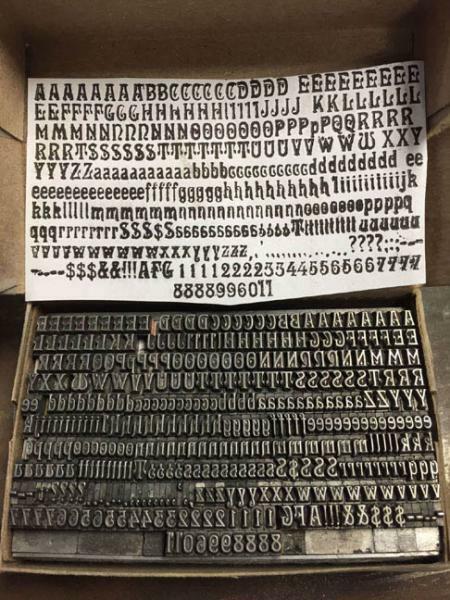 Since Dickinson had already been incorporated ATF by the time that catalog was printed, I was not surprised to see the plain ATF pinmark simply indicating the point size of your font. 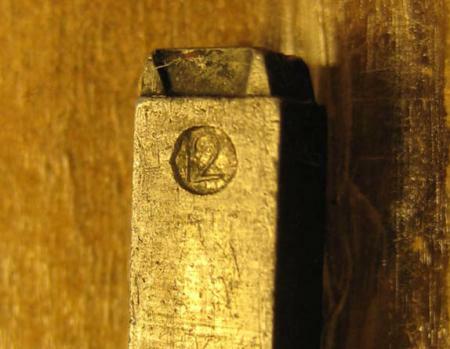 Your photo of the type seems to indicate that it has been extremely well-worn after a century of use, so it will probably be impossible to pull a clean crisp proof to match the original specimen shown. I hadn’t thought to look in the ATF era - thanks. 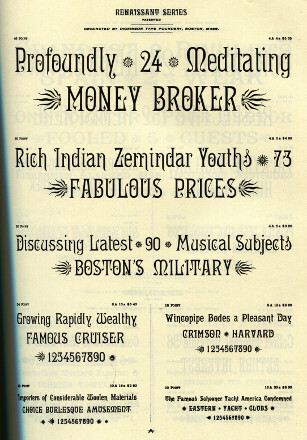 Inline here (I hope) is a tiny image of the page showing it in the 1895/1896 ATF “collective” specimen book (as reprinted in 1981 by Garland). About the pinmark photo: a simple “12” showing the point size of the type indicates an ATF typeface. After ATF swallowed up most of the typefoundries in the country, the company apparently felt that no specific company trademark was necessary.